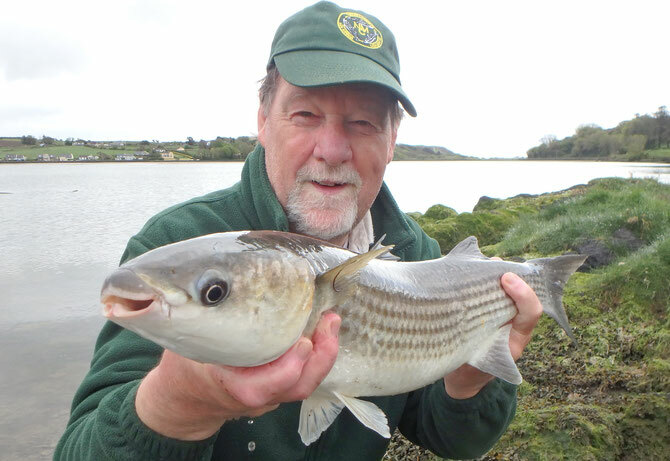 Last Friday my old friend Steve Smith flew into Cork Airport for a short mullet fishing break. 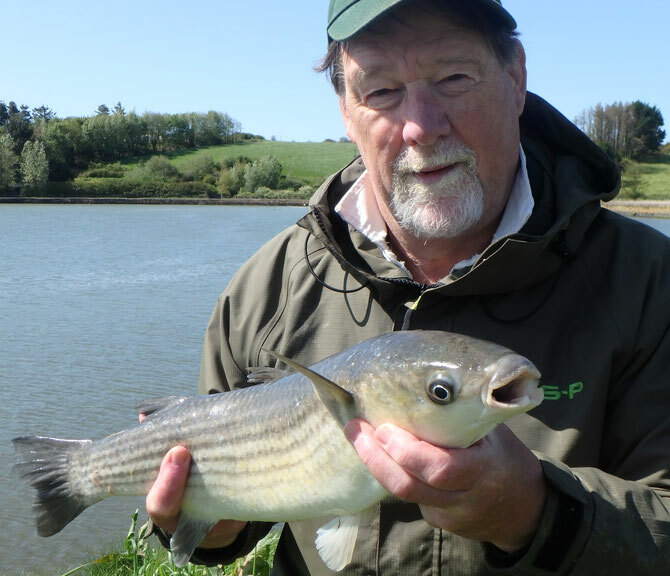 He'd decided to try an trip over in May on the basis of my early-season fishing the last couple of years, but regular followers of this blog will know that this year the fishing has been patchy so far, with a long winter stretching into a disappointing early spring. 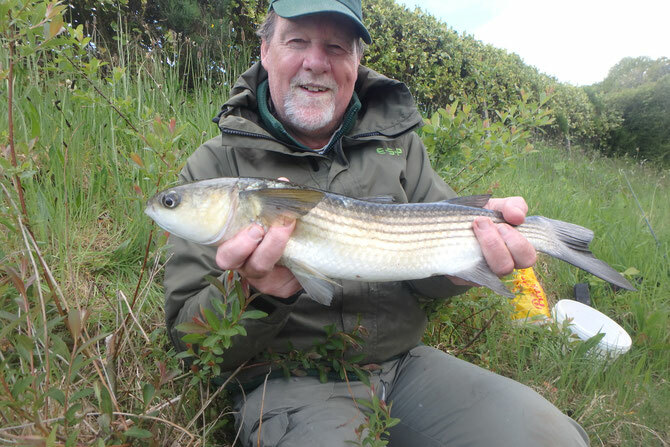 The most consistent venue has been Rosscarbery, so there we headed on Saturday for Steve's first session. The tide was still quite neap and, paradoxically, unbroken bright sunshine streamed down on us. We could see lots of mullet in the shallow water, contentedly browsing over the surface of the mud, possibly sampling the algae that has put on a growth spurt over the last week or so. They looked like they might be difficult to turn onto bread baits, and so it proved. We started off by the bridge arch. I set Steve up with two leger rods and fished one myself. Predictably, because I was keen for Steve to get off the mark, it was my tip that nodded first. I struck and played a modest mullet two-thirds of the way in, at which point it picked up one of Steve's lines and then came off. The tide came in (a little) then started to drop again without further action. We were seeing fewer fish now so decided on a move down the west bank. This restored the number of fish in front of us but we still couldn't get anything more than the occasional twitch of our quivertips as fish swam past our lines in the shallow water. Then, out of the blue, one of Steve's rods yanked over and he was into a mullet. After a game little scrap I netted it, and Steve was belatedly out of the blocks with a respectable 2:13. But any illusions that a feeding spree might be starting were soon dispelled, and as hope petered out we packed up to go and find some after-sun lotion for Steve's ears. On Sunday we started on the rocks by a seafood factory outfall on Sheep's Head. 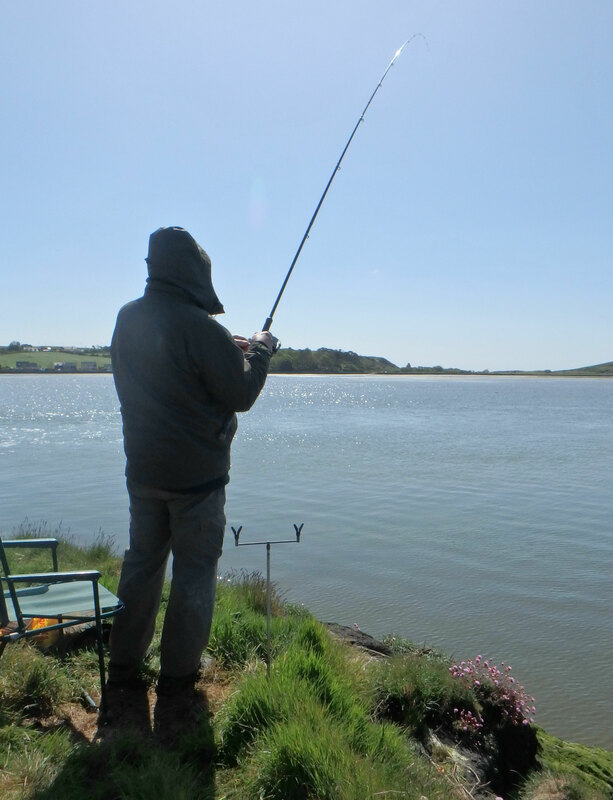 I wasn't brimming with confidence as I'd yet to catch or even see a mullet here this year, but it was mild today and perfectly calm so maybe .... Well, no, we fished the couple of hours down to low water without a bite and as an awkward westerly breeze had sprung up we decided to move on. We looked at a couple of spots round Bantry but didn't feel inspired to fish, so we headed on to Glengarriff for a look at the tidal pond. It was still early but our arrival coincided with that of a group of mullet up to about 4lbs, circling around in the water streaming in from the inlet. We watched them but decided to leave them a while in case more may join them, and we headed up to Casey's for some soup and and a half of Guinness. Back at the pond, the water had come in a foot or so and the mullet had dispersed, with most of them now showing in the far left corner. 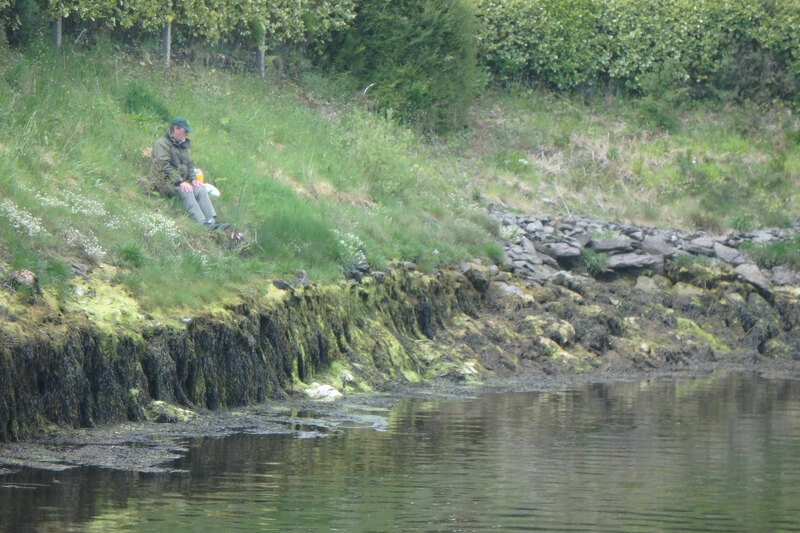 I watched as Steve made his way tentatively round the steeply sloping bank, and was relieved when he got himself sat down within float-fishing range of the fish without falling in. I started setting up my own float rod and was just tying on the hook when Steve shouted. His rod was hooped over, fish on. I followed round with the net, and by the time I reached Steve the mullet was at his feet, buried in the bladderwrack with a load of blanketweed on the line, float and fish. I managed to get the net under it and lifted the lot out. It was a long, lean but very handsome 3lb+ fish. Things went predictably quiet after that. I couldn't buy a bite fishing from the road, trotting down the edge of the flow into the pond. 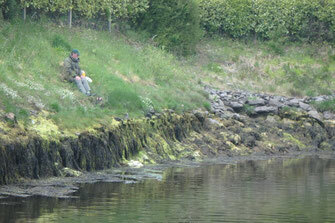 Steve moved round a few yards further and patiently fed a swim in the far corner. He started seeing a mullet coming into his groundbait occasionally, though it would just grab a piece of bread then be gone for another ten minutes or so, perhaps on some regular patrol pattern. After an hour of this, it made the mistake of grabbing Steve's hookbait, he struck into it and the fish powered out into the middle of the pond. It was still well out there when the hook came out maybe five minutes later, just as I reached Steve again with the net. Steve thought it was 4lbs+. On Monday it was back to Rosscarbery to start. The tide was bigger but I suspected we were in for another struggle with unbroken sunshine forecast all day. On arrival we could see fish all down the west side - in mud-browsing mode again - with a particular concentration around the rocky island. Steve went over to try for them with his float rod that was still set up from yesterday, while I started setting up a pair of leger rods fifty yards lower down. I got my first bait out and was just starting on the second rod when Steve called ... he was in again! I pulled in my first line then hurried over with the net. To my dismay the fish had run over the semi-submerged cable that is part-buried in the mud about thirty yards off the island, though Steve had managed to stop it just short of the evil cluster of metal posts sticking out another thirty yards beyond. I knew this wasn't going to end well, and sure enough the mullet caught on the right hand end of the cable as Steve tried to work it round. It was snagged, and we could see all manner of whelms and splashes around the cable as the mullet tried to free itself. I told Steve to open his reel's bail arm and give slack in the hope the mullet might swim out the way it swam in. Instead the fish swam in towards the shore to our right, line peeling off the reel but passing over then under the cable. Nonetheless, I saw an opportunity. I ran back to get one of my leger rods, then back to Steve. I cast between the snag and the mullet, and retrieved slowly. Incredibly, I picked up Steve's line on the very first attempt, but dropped it part way in. Same on the second attempt. But on the third attempt I pulled the line within grabbing range, then delicately hand-lined the mullet in for Steve to net. Not sure on the ethics of all this - whose fish was it or probably nobody's? But a great fish anyway, 5lb 10oz, and best of all it wasn't left tethered to the snag or towing line behind it. I stayed on the leger, Steve moved up and down the west bank with his float rod, but although we both had mullet all round our baits at times, they just weren't feeding in the bright sunlight. 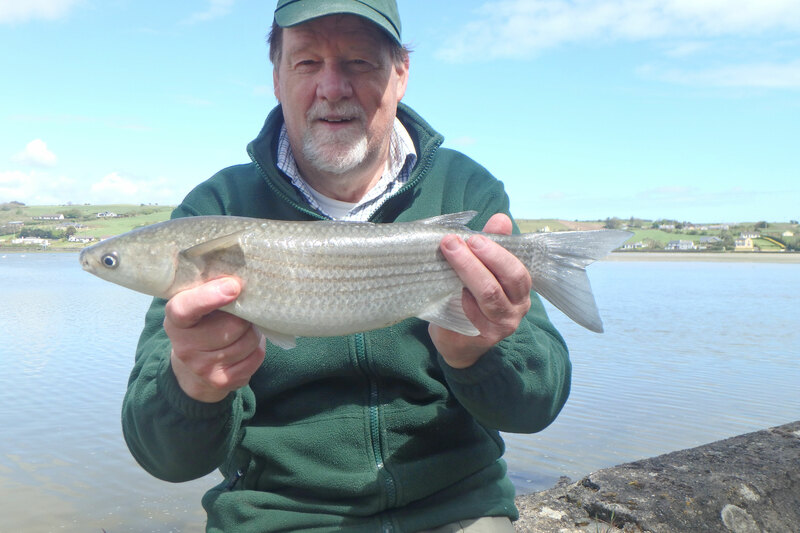 I moved over the road to floatfish the lagoon where I had a few tentative bites probably from the very small mullet I could see savaging my groundbait. After about an hour I was joined by Steve. He'd just lost a mullet from the island again, trying to stop it running over the cable. Mid-afternoon we packed up and headed west to the new spot I'd found on the Mizen peninsula. We arrived just as the tide was flowing into the shallow stream, bringing about a dozen good mullet with it. I sat with Steve introducing occasional loose samples while he fished with floating baits, slow-sinking baits, baits laid on the bottom. The fish showed some interest in our bread, but not to the extent of giving Steve a properly strikeable bite. A couple of hours later the tide was falling again taking the fish with it and we packed up slightly frustrated but having enjoyed the session. We had plenty more frustration on Tuesday. Although the conditions were theoretically better with cloud and mist, the mullet were still in a very strange mood. We saw loads at two swims around Union Hall then a few more along the coast at Castletownshend. Not a one of them ever looked likely to take a bread bait. For Steve's last day today, we headed back to Rosscarbery. Perversely, the sun was beating down again. And a north-east wind was rippling the water. It was going to be another trying session for sure! We set up by the bridge arch where we could just about get ourselves out of the wind, though the quivertips waved and the lines bowed. We couldn't get another bite, so we packed up mid-afternoon in time to catch the evening high tide out on the Mizen again, this time legering the flats of another much larger estuary. We saw a few mullet coming up on the tide, but catching them wasn't to be. It was however a splendid sunny evening in the finest of surroundings and the finest of company. I hope Steve will be back later this year.